Rangers suffered defeat at the hands of Hibernian as the SWPL leaders beat them 4-0 at Ainslie Park. A hat-trick from Hibs’ forward Lia Tweedie and a clincher from Siobhan Hunter saw the home side steal all three points. Despite the scoreline Rangers played well in spells throughout the match while creating little chances. The side saw some good spells of possession either sides of the half time whistle but just could not convert the build-up play into chances. The first half was dominated by the home side and they had the first shot of the match in the sixth minute when left winger Jamie-Lee Napier volleyed from just inside the box with her shot being held well by Jade Baillie in the Rangers goal. The Gers came back into the match after the first 10 minutes were dominated by the home side. They came to terms with the high pressing tactics from Hibs and started to have more authority in the match by playing their normal passing game and went close themselves with a couple of opportunities from set pieces. Rangers who were defending well under a little pressure for the home side were almost the masters of their own destruction when an unusually slack pass form the impressive Amy Muir gifted the ball to Hibernians Lauren Davidson only for the striker to be martialed out wide by the Gers defence. The home side pressure eventually paid off when they took the lead in the 32nd minute when some fine work form the Hibs midfield released Davidson on the left wing, she floated a high ball over the Rangers back line to the on rushing Tweedie who slotted home first time from three yards out. Some fine work by Holly Napier in the midfield then almost saw the Gers with a chance to equalise as she danced passed two Hibs players; slide a fine pass to Carla Boyce who then tried to feed Laura McCartney through on goal for the linesman on the far side to flag for offside. 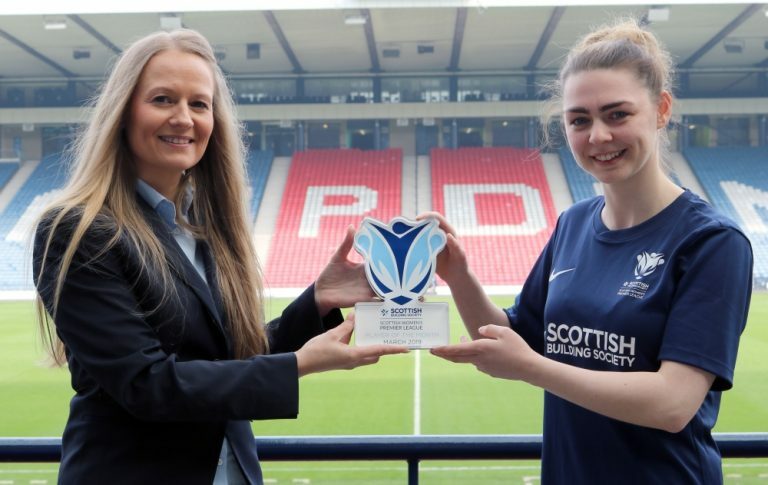 Hibs striker Tweedie doubled her sides’ advantage in the 42nd minute when she bulleted home a header from six yards, after a corner was swung in from the right hand side by Rachael Small. Gers keeper Jade Baillie pulled off a fine stop to keep it at 2-0 on the stroke of half time when Hibernian’s Kirsten Reilly struck a dead ball from 30 yards out. The Light Blues were looking likely to score next after the restart, enjoying the bulk of possession when totally against the run of play Hibs made it 3-0. Hibs striker Tweedie sealed a fine forward display by sliding home from a few yards out after a cross from Chelsea Cornet. Thus ensuring she was taking the match ball home with her hat-trick. The home side ensured all three points were staying in the capital city when on 68 minutes Colette Cavanagh low cross from the left was met by Siobhan Hunter slide footed home from the around the penalty spot making it 4-0 Hibernian. Hibs were searching for more goals and on 78 minutes Napier nearly capped -what had been a fine display from the winger- with a goal when she skimmed the corner of the Rangers goal by latching on to a through ball from Rachael Small. Rangers had a penalty shout on 87 minutes when substitute Nicole Pullar was clattered by Hibs defender Joelle Murray and keeper Fife but the referee deemed the ball was won and waved play on. In almost the last kick of the ball the home side were unlucky not to add a fifth when Hunter nearly notched her second of the game when she headed off the cross bar. HIBERNIAN: Fife, Napier, Hunter (Williamson 75), Michie, Tweddie (Morrison 75), Davidson (Gallagher 64), Notley (Cavanagh 57), Murray, Cornet, Small, Reilly. SUBS NOT USED: Currie, Leishman. SUBS NOT USED: Ramsay, Watson, Sinclair, O’Hara.